Gay bugles honk and blare. To haul the springtime north. I say drop the opening "long". Readers will scant it just as well, even better, without the opening foot, and the word long trips over itself. "echelons of laughing wings" flies freer without it. Why do I recommend such condensation? 2) the journey of the geese is not much served by descriptions of their marsh-time without your ruminations on how such travels relate to mortal sojourners like yourself. In my opinion, you're singing this one with only half your voice. All high falsetto and tenor; no baritone or bass. To light the polar dawn. Herschel Walker and Lester Young cutting their axes on opposite sides of the same grindstone. A nice condensation, of course, and I understand your points. But then, the poem loses any sense of development, and becomes almost too short for the pleasures of reading and recitation. The "long" is a metrical requirement for the scansion of the line. And then, it would be your poem, not mine. I just love this poem! Thank you. Thank you. 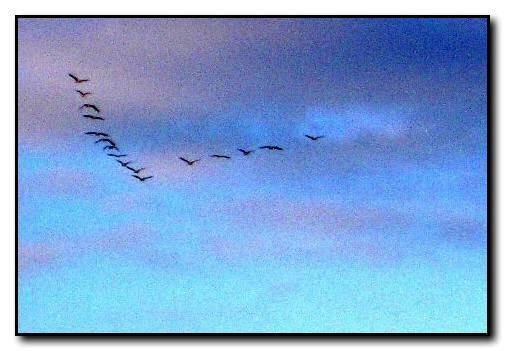 It was inspired by events; several weeks ago the first formations of geese flew over the house in a low-level, noisy run northward. I reflected at the time that the animals know we have a mild winter and early spring - better than the weatherman, I say. I try to have a heightened awareness for what goes on in nature and the world around us in general to serve as the source for inspiration. Several of the metaphors were chosen specifically for their "Dickinsonian" flavor, most specifically "feathered cloaks." It is exactly what one would expect in a Dickinson poem. Emulation is, after all, the sincerest form of flattery. It is clear to me that you are serious about your poerty. I have read five or six selections and they are very good. In fact, I can easily say, yours is the best poetry that I have yet clicked onto. I shall return!